SAVE MONEY... BE GREEN... USE HYDROGEN! 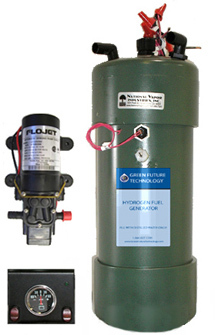 THE GFT HYDROGEN GENERATOR® WILL ADD POWER TO YOUR VEHICLE! THIS TECHNOLOGY WORKS WITH ALL VEHICLES AND ALL FUELS! The GFT Hydrogen Generator will enhance your vehicle's performance and improve mileage by 20% to 40%. It can be used on all gasoline, diesel and LP engines. From single domestic use to fleets of trucks, buses, industrial equipment, marine applications and more. GFT Hydrogen-on-Demand Generators use distilled water with no chemical additives such as lye or baking soda, which are bad for the environment and are illegal in some states. This technology is available today as a low cost hybrid solution that saves you money on fuel as it cleans your emissions. California Air Resources Board status of this device. Check with your personal Tax professional for all State & Federal deductions for which you may qualify when you purchase this alternative fueling resource. This technology is available today as a low cost hybrid solution.